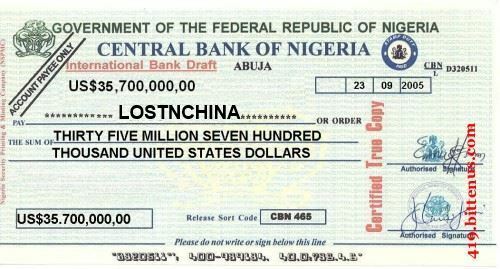 An updated version of the Nigerian letter scam is making the rounds, and has already tricked 13,500 U.S. victims out of as much as $40.5 million. IF YOU’RE FEELING LEFT OUT BECAUSE YOU HAVEN’T been victimized by any of the recent swindles, take heart: An updated version of Nigerian letter scams is targeting you. Now, the fraudsters are making the most of tough times by bombarding Americans with e-mail offers to help people get out of debt, refinance mortgages and earn extra money by working at home. An excerpt from a “419 fraud” e-mail currently in circulation. Variations on this e-mail — stilted English and all (see a portion of one at left) — are circulating in the millions. 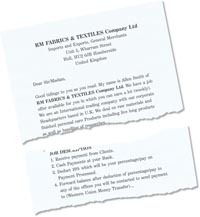 This one says that a textile company is receiving orders from North America, Australia and Europe and needs “payment officers” in those areas. All the company needs is help processing the payments — via the payment officer’s bank account. The man behind these missives is a professional fraudster in Lagos who goes by the G-mail alias Macjon. He uses at least nine other aliases through Yahoo!, Virgin.net, Btinternet and Hotmail. He also uses the same address with other fictitious companies: Crain Willis & Son, Huaxiang Group, Jaku Jenkins & Son, United Asia Trading, Anthony Smith & Son, Union Materials, European Industrial Supplies, Imperial Fabrics London, and Assorted Food Conglomerate. IF YOU SWALLOW MACJON’S BAIT, you’re automatically hired. Within a week, you receive a check made out to you for $3,200 to $4,800 from a car dealer in Nevada, an oil company in Texas or even the American Bar Association in Chicago. You’re instructed to deposit it, wait until it clears, then wire 90% of it to someone designated by Macjon, usually in the Philippines. Your bank makes the money available within a few days, but invariably, once you’ve sent the 90%, Macjon’s check bounces back as counterfeit. Investigators in the U.K. who are tracking him note that, since Dec. 1, 2008, Macjon has targeted 13.5 million Americans with the work-at-home e-mail scam. Investigators estimate his success rate at around 0.1%. That’s 13,500 victims from whom he’s stolen as much as $40.5 million. Frighteningly, Macjon is merely one of about 100 modern-day 419ers plying the trade. He and the others buy American e-mail address lists from about a dozen U.S. based “lead sellers.” In this case, it was Beginmarketing.com, based in Broomall, Pa. Prices are negotiable, but five million addresses can go for as little as a few hundred bucks. Beginmarketing also transmitted several million of the RM Fabrics’ e-mails on behalf of Macjon. The man behind Beginmarketing, Michael Flores, denies any wrongdoing. IN FACT, THERE ARE NO REQUIREMENTS that lead sellers know their clients or, for that matter, care. The Federal Trade Commission, which might otherwise be able to do something about this, is a toothless tiger. It has a Website filled with warnings about e-mail fraud, but its protection is only for commercial messages to consumers. These messages don’t fit that category, because they’re not offering goods or services, says a spokesperson. The U.S. Secret Service, which used to aggressively track Nigerian scammers, no longer updates its database of 419 scam letters as regularly, owing to budgetary constraints and manpower issues. The Secret Service would — and does — arrest anyone sending fraudulent e-mails if it comes upon them. But it isn’t nearly as active in pursuing these cases as it once was. Most lead sellers give lip service on their Websites to propriety, stating that they refuse to sell through third parties or to deal with businesses that don’t have a Website. Yet they do business with Macjon, who pays through third parties and whose phony companies don’t have Websites. Hearing that e-mail quoted, Reid mumbled, “I’m out of here,” and hung up. JEFFREY ROBINSON writes books about fraud, money-laundering and organized crime.